Clicktodiscount.com > Freshdesk Review 2019 – The best customer support software? 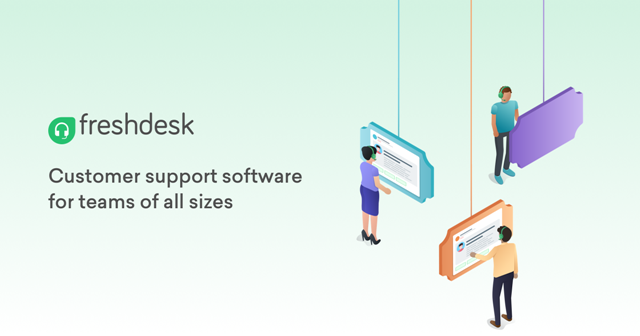 Freshdesk Review 2019 – The best customer support software? Freshdesk is a cloud based helpdesk solution that offers everything a business needs to deliver exceptional support. This is a big improvement over handling support via email. In this Freshdesk review we will take a look at its features, pricing and some pros and cons. Freshdesk is a cloud-based helpdesk software that streamlines customer conversations across multiple channels including email and phone. It enables faster collaboration with your support team for quick responses to your customer. Freshdesk also offers a great free trial plan that allows you to test all key features of the service. My detailed Freshdesk review will help you to understand more about its capabilities and features. Keep track of customer conversations by converting them into tickets. I think this is one of the most useful features that I have to mention it on top of my Freshdesk review. Team Inbox: Track and manage incoming support tickets from multiple channels with one inbox. SLA Management: Set deadlines for ticket response and resolution based on different business hours or categories. Agent Collision Detection: Ensure that multiple agents don’t wind up working on the same ticket by accident. Custom ticket status: Create custom statuses that suit your workflow to identify what stage a ticket is in. Scenario Automation: Perform multiple actions on a ticket with a single click by automating repeated actions. Canned Responses: Provide quick, consistent responses to common questions by creating pre-formatted replies. It takes a team to deliver great customer support. Team Huddle: Discuss specific parts of tickets with experts from across your company to figure out the best solutions. Shared ownership: Share ownership of tickets with other teams without losing visibility into progress being made on the issue. Linked Tickets: Link related tickets together to keep track of widespread issues and deliver consistent responses. Parent-child ticketing: Resolve complex, multi-stage issues faster by splitting them into smaller child tickets. One helpdesk for all your support channels. Email: Convert support emails into trackable tickets in your helpdesk that you can manage and resolve. Phone: Set up a fully functional call center and record and track calls by converting them into tickets. Chat: Engage, support, and retain customers through live chat. Social media: Integrate your company’s Facebook page and Twitter handles and manage them from within the helpdesk. Website: Let customers raise tickets from your website and display related knowledge base articles as they type. Use Freshdesk’s powerful automations to streamline your helpdesk and your support process. Ticket dispatch: Automatically assign tickets to agents and groups based on keywords, requester or properties. Intelligent ticket assignment: Assign tickets to agents based on their current workload, skill or using the round robin method. Time-triggered automation: Execute maintenance activities on tickets based on the time-lapsed since an event happened. Event-triggered automation: Implement one or more actions on specific tickets as soon as an event happens. Automatic Email notification: Notify customers and agents automatically about the changes happening in their ticket. Create a self-service experience that supports your brand and improves customer satisfaction. Automatically suggest solution: Allow relevant solutions to pop up for customers and save time for your agents and customers. Email to Kbase: Let agents convert their ticket replies into knowledge base articles, as they reply. Feedback mechanism: Writers will be notified automatically about feedback on their articles so they can implement them. Solution article analytics: Monitor article metrics like number of views, likes and dislikes. Reset metrics when the article is revamped. Forum Moderation: Setup moderation workflows to ensure posts violating your guidelines don’t go live immediately. Link forum topic to ticket: Convert critical issues raised in the community into tickets so they get the required attention. Freshdesk’s reports help you monitor helpdesk productivity, customer experience and agent workload straight out of the box. Helpdesk reports: Understand how different agents and groups are performing based on various helpdesk metrics. Customer satisfaction ratings: Gauge how customers feel about your support using customer satisfaction reports. Dashboards: Monitor your helpdesk using real-time data about tickets, trends and groups. Answers and Insights: Easily access data and reports and get custom insights important to your business everyday. Schedule report: Schedule default and custom reports so that you can receive them in your inbox periodically. Customize your support portal and make it an extension of your brand. Define workflows to suit the way that your team works. Portal customization: Customize the look and layout of your support portal with full CSS customization and ready-made themes. Customize agent roles: Give differential permissions for access and actions according to the roles and responsibilities of agents. Custom ticket forms: Collect information relevant and important to your business by adding and modifying fields in the ticket form. Custom URL: Use your own vanity URL for your support portal and provide a seamless customer experience. Custom Apps: Build and integrate custom apps to carry out workflows that are unique to your business. Freshdesk take security seriously and they are committed to running a secure, reliable and available helpdesk. Custom SSL certificates: Freshdesk accounts come with custom SSL certificates that let you secure your own support domain or vanity URL for a safe and personalized experience. IP and Network restrictions: Whitelist IP ranges, restrict login access outside of work or create secure and exclusive access for agents to login from anywhere by linking IP whitelisting to a VPN (virtual private network). Identity & access management: Let agents and users login to Freshdesk using their other accounts by setting up a single sign on (SSO) script to authenticate their credentials. Freshdesk provides 5 packages for you to choose. You may save additional money by using Freshdesk discount coupons at the checkout process. Don’t miss! Provides multiple ways to raise tickets. Allows you to customize to reflect your brand. Fully-operational API which is convenient to use. Convenient customization of solutions (with multi-language features). Is missing core functionality if your business adheres to ITIL. Some pricing tiers might be expensive for some businesses. In conclusion of this Freshdesk review I need to emphasize this is a good choice for ticket management. Because it is simple to use and even contains a few advanced features not found in more expensive help desk solutions. I hope my Freshdesk review can help you to make the right decision. SpinnerChief Review –The best article spinner? Hive.com Review – The productivity stack for 2019? SendPulse Review – The best multi-channel marketing platform? Instapage review – The most powerful landing page platform?